Dear Visitor, You are visiting handmade medium size unisex wallet. 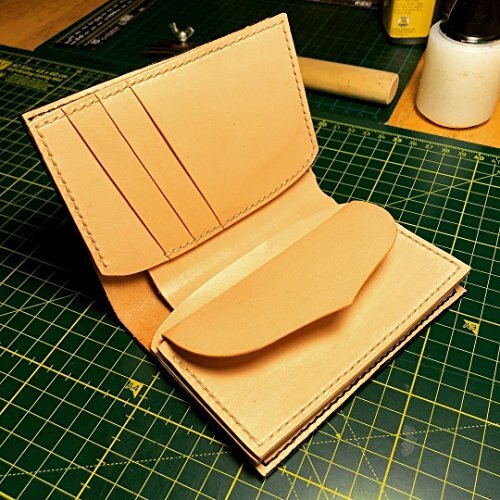 Made from full grain vegetable tanned leather with pure handcrafting skills and basic tools. This above average sized wallet has a large very bill pocket, 3 credit card slots, 2 very deep secrets pocket and a large pocket for coins or extra cards. The wallet in the pictures is Dark brown back with natural inside. You can choose to customize the shell color and inside. When open the wallet is measured 18 cm x 14 cm (7" x 5,5"). The thickness is 1.5 cm or approx. 0,6 inch. Method: Made to order within 5-7 days and 3-5 days shipping all around globe. All items and all parts are handmade (cutting, painting, stitching and burnishing). No electrical machines are used besides music for hi-fi and light for desk lamp. I also provide pictures while crafting items to buyers. That assures the color or customizations you have asked are applied properly. Every wallet will be slightly different from the other due to natural materials and pure handcrafting which makes them unique and interesting. Leather: I carefully choose my hides from 5th generation tanners. I always use non dyed full-grain leather, which has unaltered skin. Tanning process for vegetable tanned leather is 30-60 times more time consuming than chemical processes. That time difference is reflected in the general strength and feel of the item produced. Also natural leather will age and look better in time which is not possible for faux/chemical processed leather. Top grain leather has non altered surface, I may choose to keep small scars that animal took. As long as structure is not disturbed they add nice details in my opinion. I don't work with faux leather at all. My leather items don't have any foul or sharp smell because I reject to use any aggressive chemicals / glues which is not safe for me in the first place. If you have any questions about this product by CloudyLeather, contact us by completing and submitting the form below. If you are looking for a specif part number, please include it with your message.